The flower of a tomato plant has the pollen so tightly held on the anther that it takes the vibration of a bumblebee to loosen it. The bee becomes dusted with the golden treasure, and leaves that flower for the next flower, spreading this elixir of life for tomatoes while gathering some for his own family back at the hive. After WWII, when we began monocropping larger and larger farms, we used all the new pesticides invented during the war to kill off all the “weeds” in the fields which were too large to work by hand and making it easier for farmers to grow and harvest huge amounts of food. 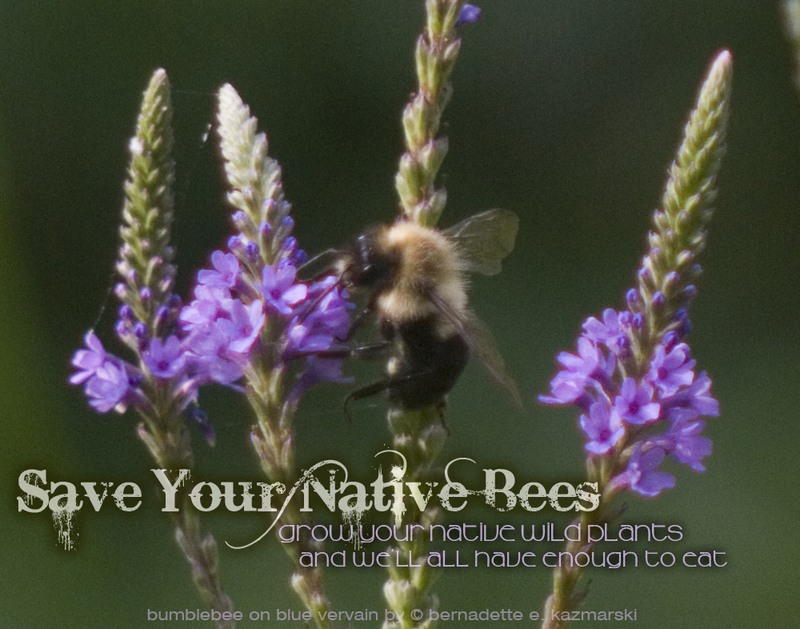 But the “weeds” were native wildflowers that fed the bees, that pollinated those fields. I listened to a speaker tell us about all the ways bees make life on earth possible. Bees, yes, the ones we may be frightened of stinging us, the ones we don’t want building nests in our attics, the ones we wave away at picnics, the ones that are disappearing all over the globe and no one understands why. 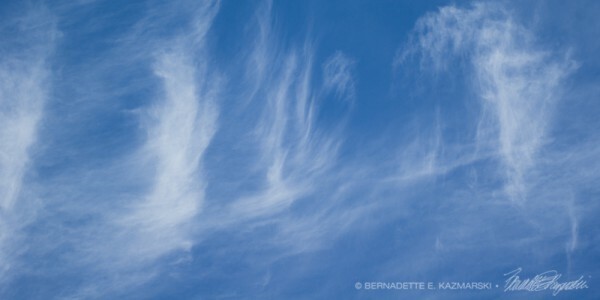 I heard Marla Spivak in a segment entitled, “Why Are Bees Disappearing?” on the TED Radio Hour, which offers three or four segments of TED Talks under one topic, this one being “Everything Is Connected”. The delicate purple spikes of blue vervain bloom in the quiet time of the summer, elegant and dignified among the frenzy of production in my vegetable garden. 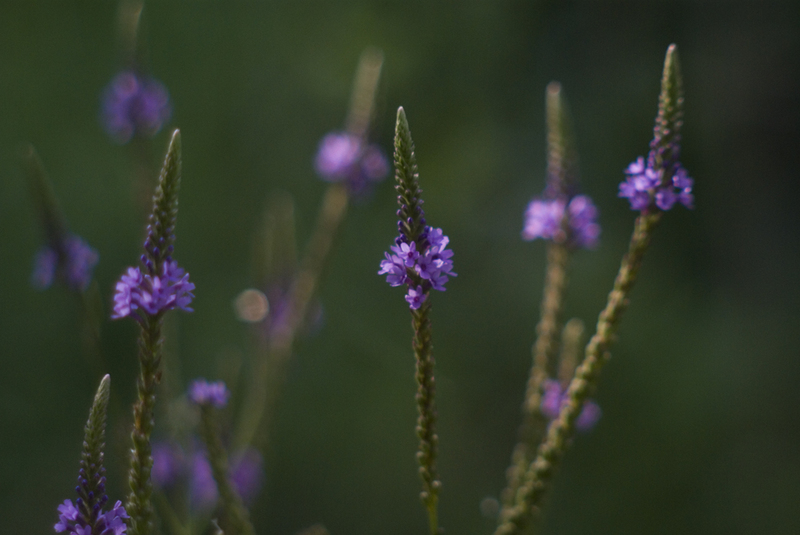 One of my favorite wildflowers for its color and its sweet blooming, blue vervain was a volunteer in my garden, finding my little space acceptable to its needs. In return I am rewarded with watching native honeybees visit to collect pollen, knowing I am at least doing a bit in the effort to save them by maintaining a wildness about my yard. I watched this bee march all the way around each little circlet of flowers before moving on to the next circlet. And purple and green below—my favorite color combination! Looks like it might be Euglossa dilemma or a Little Green Sweat Bee, but I don’t know my bees all that well. The tiny spiders have taken up residence as well. In fact, blue vervain is native to most of North America and along with the flowers attracting important pollinators, the seeds are also important through the winter for songbirds, and the plant is the larval host for the common buckeye butterfly and it has a long history of medicinal use for humans. Refer to this USDA document to read more. 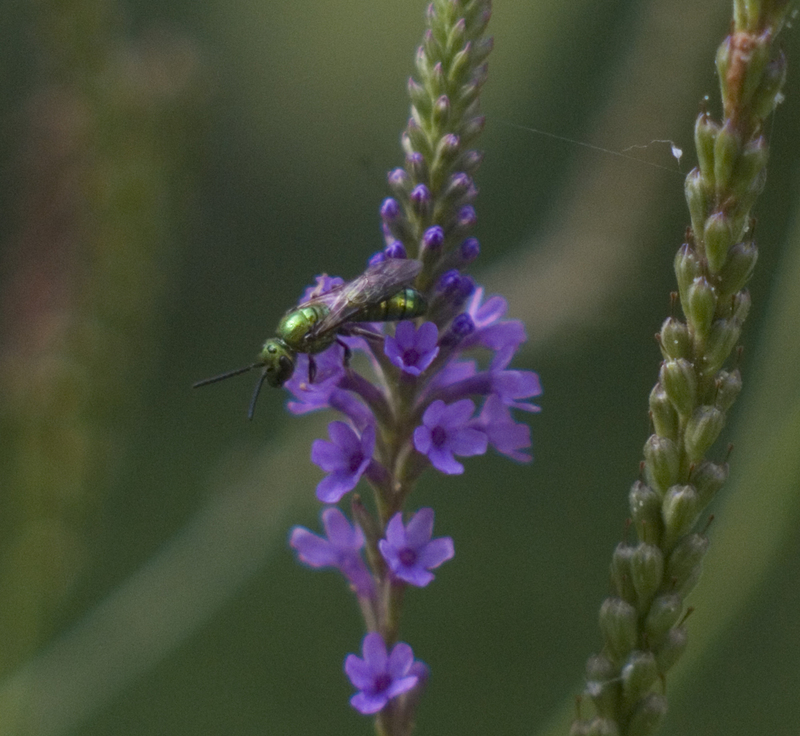 Little Green Bee, also an important pollinator. Please feel free to copy and past this image with a link back to this post. Here’s another post with bees and wildflowers. Rumpydog, everything is about “easy”. And we pay for that too! What a waste.